- CHF drifts lower after Sunday "flash-crash" during Asia open. - Sudden loss still a mystery to traders after SNB stays mum. - Saxo Bank warns of possible intervention if EUR/CHF hits 1.12. The Swiss Franc sold off sharply during the overnight session in what has been described as "flash crash" that still remains a mystery to traders, although the market is conscious that strength in the safe-haven currency could lead to a Swiss National Bank (SNB) intervention during the coming weeks. 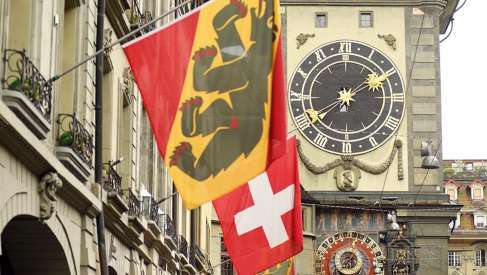 Switzerland's currency fell by around 1% against the Dollar, Pound, Euro and most other rivals during the Asia open on Sunday evening only to immediately recoup losses. The sudden and viscious movement was over in the blink of an eye, leaving traders nonethewiser as to why it happened almost a full day later. The Swiss National Bank declined an opportunity to comment on the move Monday, which one analyst says is unsurprising given the relatively small nature of the move and due to market conditions around that time on a Sunday. "There's nothing to comment on," says Viraj Patel, an FX and macro strategist at Arkera. "A 1% move in thin liquidity is not a crash. I mean if anyone knows about seismic FX market moves.. it's the SNB." Patel has a point. Neither the Swiss National Bank nor the Franc are strangers to significant market volatility, especially after the huge double-digit revaluation to the upside that took place in January 2015 and given the European unit's status as safe-haven currency. Above Pound-to-Franc rate shown at hourly intervals. The USD/CHF rate was quoted 0.43% higher at 1.0036 around noon Monday and is up 1.9% for the 2019 year-to-date. The Pound-to-Franc rate was 0.38% higher at 1.2952 and has risen 3.5% this year, while the EUR/CHF rate was 0.38% higher at 1.1350 and has gained 0.38% in 2019. Above: Pound-to-Franc rate shown at weekly intervals. Captures January 2015 revaluation. The Swiss Franc rose by more than 20% against all of its developed world rivals in the blink of an eye back in January 2015 after the Swiss National Bank took the market by surprise with a decision to abandon its "peg" to the Euro, which sent shockwaves through financial markets. Before then, the SNB had threatened the market with active intervention in the event the EUR/CHF exchange rate fell below the 1.20 threshold, which had kept the market largely in check. However, macroeconomic conditions going into 2015 were such that market pressure on the cap was building and defending it would have eventually come to be a burden on the SNB. The European Central Bank (ECB) was at the time, rightly thought to be preparing a record breaking stimulus programme that eventually forced the EUR/USD rate down from 1.40 to beneath 1.10. Preventing EUR/CHF weakness in that environment would have been costly. "Lower yields and a creeping rise in EU existential risks at the margin are driving EURCHF back lower, but the SNB jis likely to get busy if the pair approaches the 1.1200 area again," warns John Hardy, chief FX strategist at Saxo Bank. The Swiss National Bank still intervenes in the foreign exchange market to this day in order to safeguard financial stability, which can be adversely effected by low levels of inflation that can become entrenched by persistent currency appreciation. Saxo Bank's Hardy and others tend to view the 1.12 level of the EUR/CHF rate as one that will draw the SNB off the sidelines and into the market. In this style of intervention, the SNB would sell quantities of its own currency on the interbank market and buy Euros with the proceeds in order to force the EUR/CHF rate up. Above: Euro-to-Franc rate shown at daily intervals.